35 years’ work experiences. 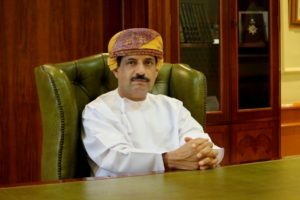 Mr. Abdulla Ahmad Sulaiman Al Hadi, the founder and Chairman of Gulf Mining Group is a visionary who saw the potential of GMG playing a significant role in developing abundant mineral resources of Sultanate of Oman particularly the chromite. He spent several years researching and “walking” over chromite deposits throughout the country. He brings to Gulf Mining Group a long experience in administration and management gained during a distinguished career in the Sultanate of Oman Armed Forces and Royal Office. A true humanitarian from the core of his heart, he is contributing generously to the welfare of the society in and outside Oman.